Infections of the airways caused by Ornithosis, Pneumonia, Mycoplasmosis, Psittacosis (Chlamydiosis) in birds. • Lethargy, rued / fluffed-up feathers, loss of appetite, weightloss, weakness. 5 g / 2 liters of drinkingwater, 5-10 consecutive days. 1 g/2 kg of body weight, or 3 g/200 ml drinkingwater, 5-10 consecutive days. 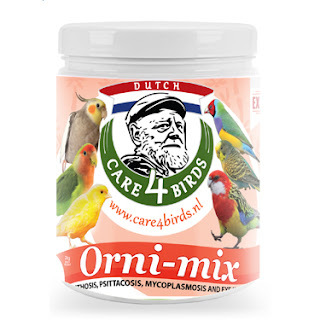 For treatment of Psittaccosis (Parrot fever): 1 g/2 kg of body weight, or 3 g/200 ml drinkingwater. Duration of treatment is for 45 days. All sources of calcium need to be removed for this period, as calcium aects the uptake of the antibiotic.